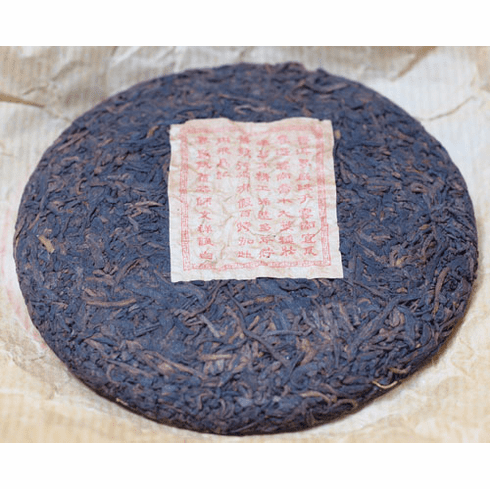 This aged Puerh tea consists of tea leaves which have been compressed into a circular disc about 4.25 inches (10.7 cm.) in diameter. After it has been formed into this flat cake, the tea is left to age enhancing its flavor and potency. Once steeped, one can enjoy the bold earthy aroma. Its drinking experience is highlighted by its smooth body and rich flavor leaving your palate with a sweet aftertaste. To enjoy, break off a small piece from the cake and carefully crumble it into a cup or teapot. Boiling water should be used for steeping. Use 0.1-0.2 ounces (3-6 grams) of loose Pu-Erh tea of every 1-1.5 cups (150-300ml) of water. Steep for about 2-3 minutes or until desired concentration is used. Available in approximately 3.5 ounce (100 gram) cakes. Shipping weight is 0.30 lbs.